This guide will take you through the Conductor REST API which was introduced in Conductor version 1.5.0. The Conductor REST API provides API endpoints for Conductor which allow developers to interact with sites remotely (i.e. via AJAX requests). 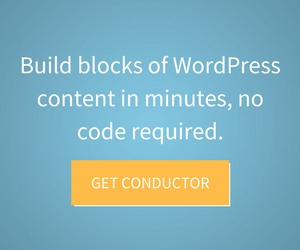 The Conductor REST API is an extension of the WordPress REST API. Note: As of April 2018, the Conductor REST API only contains one route for fetching Conductor Widget query results. We have plans to expand the Conductor REST API in the future. At this time there are currently no authentication methods available for use in the Conductor REST API. We have plans in the future to possibly allow for various forms of authentication. Note: Due to the lack of authentication methods, we’ve provided different ways to disable the Conductor REST API. See the “Conductor Options” and “Conductor Widget Settings” sections below. The base URL for the Conductor REST API is: /conductor/v1/ (e.g. http://website.com/wp-json/conductor/v1/). If a GET request is made to this URL and the Conductor REST API is enabled, the list of all Conductor REST API endpoints is returned. The Conductor REST API can be enabled or disabled via the “Enable Conductor REST API” setting on the Conductor > Options page. Enabling or disabling the Conductor REST API via this setting affects the global scope. This means that, if this setting is set to “Off” (disabled), the Conductor REST API will be disabled across the entire website and Conductor REST API route requests will not work as expected. More granular control is outlined in the “Conductor Widget Settings” section below. Individual Conductor Widgets can be enabled or disabled in the Conductor REST API via the “Enable in Conductor REST API” setting in the Conductor Widget > Advanced Settings section. This setting allows for more granular/specific control. Enabling or disabling an individual Conductor Widget in the Conductor REST API via this setting only affects that Conductor Widget. This means that, if this setting is unchecked (disabled), only that individual Conductor Widget will be disabled from the Conductor REST API.